An Internal Revenue Service audit recommends stripping a New York-based charity of its tax-exempt status after it served as a conduit for donations for a convoy that delivered cash and goods to Hamas officials in Gaza. The investigation was prompted by a 2009 report by the Investigative Project on Terrorism that documented statements during a Viva Palestina fundraiser directing contributions to the charity, the Interreligious Foundation for Community Organizations (IFCO)/Pastors for Peace. Viva Palestina is the brainchild of British MP George Galloway. Viva Palestina's U.S. website directed donations to an address in Chicago, explaining that IFCO "is serving as fiscal sponsor for Viva Palestina USA. Your donation to Viva Palestina - IFCO is fully tax deductible under IFCO's 501(c)(3) tax-exempt status." U.S. Reps. Brad Sherman, D-Cal., and Sue Myrick, R-N.C., wrote to IRS officials asking that they determine whether IFCO did, in fact, accept and process donations for Viva Palestina. "If so, IFCO's status as a 501(c)(3) entity must be revoked," Sherman wrote. "The taxpayers of the United States should not and cannot support the activities of recognized terror organizations. [Emphasis original]. The IRS had an answer last October. "Based on our examination of Inter-Religious Foundation for Community Organization Inc. (IFCO), we have determined that IFCO does not qualify for exempt under section 501(c)(3) of the Code," the report explains. IFCO attorney Martin Stolar responded in December, accusing the IRS of being wrong on the facts and the law. "No funds were supplied to HAMAS or to any entity controlled or operated by HAMAS," he wrote. IFCO posted both the IRS report and Stolar's response as part of an appeal for people to lobby the IRS and politicians against removing IFCO's tax-exempt status. IFCO is a "victim of political persecution," it says. "Imagine, the first national foundation controlled by people of color in the United States, now being denied tax-exempt status by the US government." IFCO blames the Investigative Project on Terrorism, and tries to discredit it. "This group is believed to be a propaganda arm of the Israeli government," Stolar wrote, "and cannot be relied upon for the purpose for which the IRS uses it, i.e. that there was a connection between the Viva Palestina program and HAMAS." It is a tactic used by others the IPT exposed for supporting terrorists. It has not worked. Viva Palestina was not incorporated in the United States and never had tax-exempt status. There is no dispute that IFCO agreed to accept Viva Palestina donations and use its exempt status as an enticement. "The Interreligious Foundation for Community Organization (IFCO), which has been working for racial, social, and economic justice since 1967, is serving as fiscal sponsor for Viva Palestina USA," Viva Palestina's website said. Your donation to Viva Palestina - IFCO is fully tax deductible under IFCO's 501(c)(3) tax-exempt status." During a July 2009 Viva Palestina fundraiser, then-IFCO Executive Director Lucius Walker said that "we could not avoid being a part of this historic [convoy] effort to give the people of the United States an opportunity to visibly demonstrate their opposition to our government's policies, our government's callousness and our government's complicity with Israel's efforts to destroy the hopes and the aspirations of the Palestinian people. And so we have been honored to be able to receive funds on behalf of this effort that we are here as a part of." At the same event, attorney Lamis Deek, who also serves on the Council on American-Islamic Relations' New York chapter's board, acknowledged that politics was the "essence" of the convoy, even more than supplying relief aid. "The first and foremost among them with this convoy, without question supports is the rights of Palestinians to self-determination, the right the government to choose, not only the government under which they want to live, but in choosing Hamas, what they chose was one united Palestinian state on all of the 1948 territories from the north to the very south. That is what Palestinians chose. And in supporting Palestinian choice we are saying we support their right to liberation from violent colonialism." Three weeks later, Deek asserted that, "Jerusalem must be the capital of Palestine," adding, "We reject Zionism as a racist and criminal ideology." So does Hamas. Even Palestinian Authority President Mahmoud Abbas described the convoy as a "propaganda tool" for Hamas. In March 2009, before the IFCO fundraisers, Galloway boasted that he would give aid to Hamas and dared anyone to stop him. "I personally am about to break the sanctions on the elected government of Palestine…" Galloway said, adding that the convoy would deliver 100 vehicles loaded with supplies and that convoy members carried in huge sums of cash strapped to their bodies. He would give it to Hamas Prime Minister Ismail Haniyeh. "Here is the money," he said, holding up a bag of cash. "This is not charity," he repeated three times. "This is politics. The government of Palestine is the best people to decide where this money is needed. We are giving this money now to the government of Palestine." Galloway concluded by saying that the convoy raises hopes "that one day, we can return to our country, that we can return to our country, that we can drive them [Israelis] away, and we can return to our country." Another Viva Palestina convoy made its journey to Gaza in December 2009 and January 2010. Hamas leaders turned out to greet it during stops in Turkey, Lebanon, Syria, Jordan and Gaza. In Jordan, flags for Hamas and its military wing were prominently displayed. Deputy political director Mousa Abu Marzook told the convoy that Hamas terrorism – he called it "resistance" – would continue. "Allah is our goal. The Prophet Muhammad is our leader. The Koran is our Constitution. Jihad is our path. Death for the sake of Allah is our most exalted desire." A convoy participant described meeting Haniyeh during the 24 hours the group spent inside Gaza. Another wrote that the government "provided bus service, hotel, meals, security (photo at right), and a tour of Gaza" for convoy participants. He was uneasy, he wrote, because "supporting Hamas is illegal for Americans because the U.S. Government considers Hamas a terrorist organization, [so] I took care to distance myself from tour events that were not humanitarian in nature." Hamas has been the controlling power in Gaza since it ousted its rival Fatah in 2007 in bloody clashes. Israel imposed a blockade on Gaza in an attempt to stem the flow of weapons and supplies that could be used in terrorist attacks. A 2011 United Nations report found that policy to be "a legitimate security measure in order to prevent weapons from entering Gaza by sea and its implementation complied with the requirements of international law." However, the blockade did not stop Hamas from smuggling in thousands of rockets which it fires on Israeli civilian communities. It also triggered convoys like Viva Palestina and flotillas aimed at breaking the blockade. In 2009, IFCO took in $1.2 million, the IRS audit found. More than $885,000 was transferred out, including some which were invoiced in Farsi, the official language of Hamas's patron state Iran. The Farsi invoices were paid without being translated. IFCO refused to make anyone available to discuss this action with the IRS. That's under the advice of counsel, Stolar wrote. While he insisted there is no evidence showing IFCO or Viva Palestina sent money to Hamas, IFCO's refusal to talk about it should not be surprising "in view of the legal posture of the federal material support criminal statute. If IRS could grant immunity or otherwise guarantee that no testimonial evidence from an IFCO officer, Director, or employee would ever be used in a prosecution based on the material support statute, that would solve the problem." But IFCO also failed to include information about its partnership with Viva Palestina on its required annual tax forms, known as 990s. A standard question asks whether the organization was involved in grants or assistance worth more than $5,000 to foreign recipients. IFCO checked no. The IRS got no response when it sought more information, including questions about how donations were solicited and handled. The audit also found fault with some of IFCO's convoys to Cuba. It is not clear what happens next. 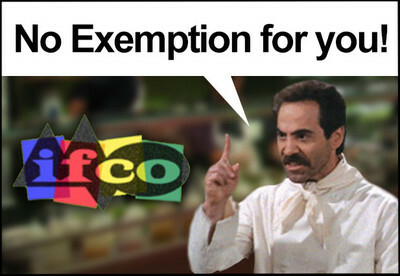 IFCO continues to enjoy tax exempt status.